I just read this hilarious little post on Daring Young Mom . I thought about sharing my rant there, but that didn't seem in the spirit of things, so I'm getting on my soap box over here where I belong. I work really hard not to buy foods with high fructose corn syrup (HFCS) and trans fats. Tortillas are the hardest thing to find. 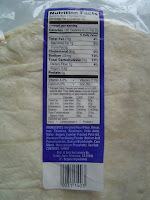 Even if they have 0% trans fats per serving there may still be partially hydrogenated oils in the ingredient list. I just checked Mission's web site (search for "trans fat" on that page and you'll find several informative sections) and they claim that they have stopped using these, but the stores I shop at aren't stocking the new product. 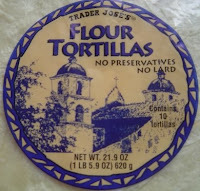 Lately I've given up looking at the regular grocery stores to see if the companies have finally come around (although I'm glad that Mission has realized it was a bad idea) and just buy our tortillas at Trader Joe's. They have packages of 10 tortillas for less than $2 that freeze beautifully. And -- drum roll, please -- no freaky ingredients!